I’ve been learning fast about arts and crafts for toddlers and young children, but when it comes to science experiments I haven’t a clue! Luckily I managed to get a bit of hand-holding from the fabulous Mary Catherine, author of Fun-a-Day. Mary Catherine guided me towards some of her science experiments that she thought might be suitable for F (ages 2.5yrs). This experiment seemed like a good place to start. Fun-A-Day lined a tray with some baking soda, then sprinkled on rows of two different flavours of Jello. Using eyedroppers the children added water to the tray. I recreated the same set-up, using lemon and berry blue Jello powders. F was very intrigued to get a reaction when he dropped some water into the tray. He also wanted to refill the eyedropper by himself too. The yellow and blue powders started to blend together to make green, and it occurred to me that this would be a great activity to accompany Mouse Paint! After a while though, F started to lose interest. I was a tiny bit sneaky and replaced the water with vinegar. This time we got some fun bubble eruptions! This was a great sensory experience too as the Jello produced amazing smells. I remember from making Jello Play Dough that the berry blue flavour is my absolute favourite! F swirled the colours round with the dropper and got some lovely patterns. Mary Catherine put this activity together for her son’s Skylander party. She froze jewels in ice cube trays and invited the children to melt the cubes using a combination of water and salt. I found some little jewels at the dollar store and froze them in an ice cube tray filled with water. First of all I gave F a condiment bottle full of water to pour on the ice cubes. I then realised that the orange bowl was too deep for F to easily reach into, so I quickly changed containers. That’s better! Then I gave him some salt to spoon onto the ice cubes. Slowly the jewels started to emerge. “Treasure!” he exclaimed! After he’d rescued a few of the jewels his attentions moved elsewhere, but he came back to it later and fished out the remaining treasure. I felt pretty brave trying this one. I’d tried making slime once before but on the whole I try and stay clear of icky sticky things. So what is oobleck? Mary Catherine writes: “This particular slime recipe is also called oobleck. The term oobleck comes from the Dr. Seuss book “Bartholomew and the Oobleck”. It refers to a specific non-Newtonian liquid made up of cornstarch and water. In case you’re wondering, a non-Newtonian liquid is basically a liquid that doesn’t react the way most liquids do. With oobleck, the harder it’s pushed/ pulled on, the more like a solid it becomes. The less it’s pushed/pulled on, the more it acts like a liquid”. I provided F with straws, craft sticks and a spoon. He immediately dug into the mixture with a straw but I think he was rather uncertain about it! But he kept on playing with it! The texture of this oobleck is SO hard to describe. You can see in this picture that F has just scraped some away from the dish leaving a space – at this point it feels solid. Then he holds up the craft stick and it gloops back down into the dish like a thick liquid. It’s fascinating! He played with this for some time, and had to stop as a friend turned up to play. When we went back to it a few hours later, it seemed completely solid. When I turned it over with a spoon, it slowly oozed into a liquid. This is WEIRD stuff! In the end this wasn’t a messy activity at all – however this was mainly because F wouldn’t actually touch it! We finished with some more baking soda and vinegar experiments. Following our colour mixing activity I couldn’t wait to try this one! We duplicated Fun-A-Day’s original experiment and mixed Jello powder and baking soda together, then added vinegar. I used three different flavours of Jello: lemon, lime and berry blue. We started with the lemon mixture and got some nice yellow citrusy bubbles. Then onto the lime mixture. F added more vinegar this time and said “wow” when it bubbled over the top of the bowl! Then we tried the berry blue which was my favourite as it had the strongest scent. And F used up all the vinegar so we got LOADS of bubbles! I was really grateful to Mary Catherine for her help with getting us started with these science experiments! Please head on over to her blog and let her inspire you too! 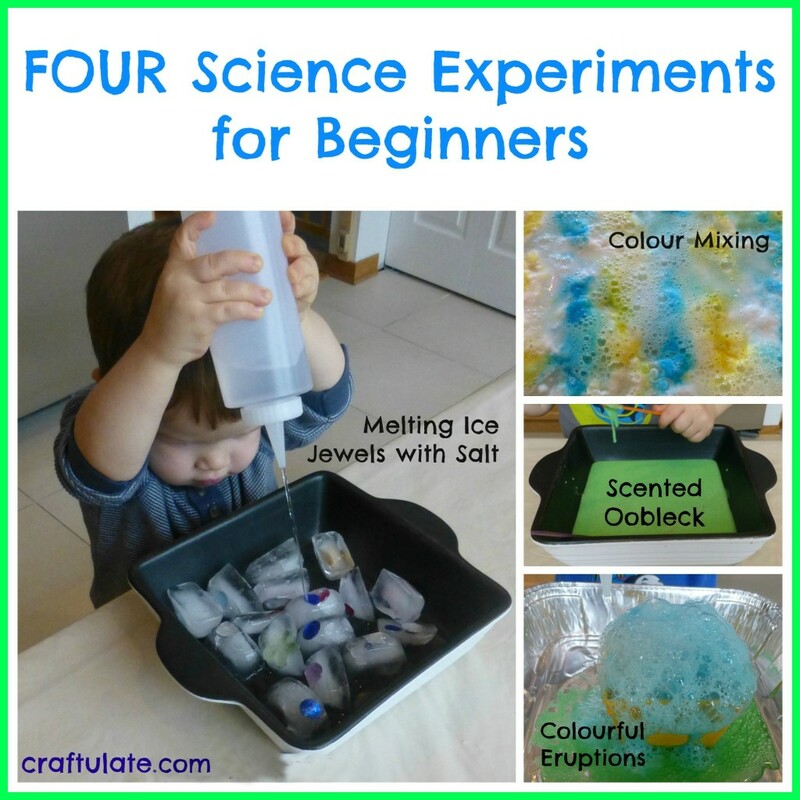 She has also written a really useful list of 15 tools for fun science and sensory play. You have a terrific ideas my little one is only 5 months but I’m storing all kinds of good ideas for later . . . Kudos to all hands on moms !